Home / Competitions / Concert / More Free Tickets! 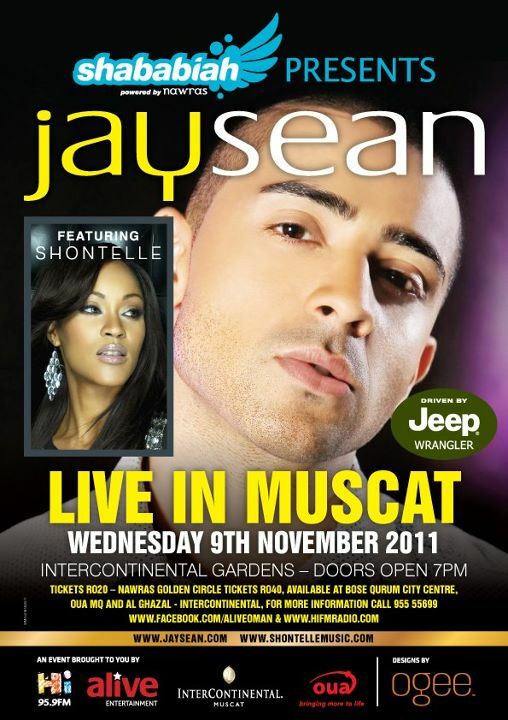 Jay Sean & Shontelle! More Free Tickets! Jay Sean & Shontelle! The ticket masters are being kind to me at the moment, and I'm very pleased to open the competition to win 2 free VIP tickets to the Jay Sean / Shontelle concert being held at the InterCon gardens on Wednesday 9th November from 7:00 pm. Tickets are still available and cost RO 20 for general admission of RO 40 for VIP admission. You can get more information from the Facebook event page here. Tickets can be purchased at OUA MQ branch, Bose store in Qurum City Centre and Al Ghazal pub at t'InterCon. As always, all you have to do is email me at mrsythe [at] gmail.com or leave a comment here - if you leave a comment please make sure there is a way for me to contact you should you win! I'll announce the winner next Tuesday evening! Baby are you down down down! I am in India Bangalore and it is raining heavily here. So sure you can expect rains in Muscat too. Happy eid and holidays.